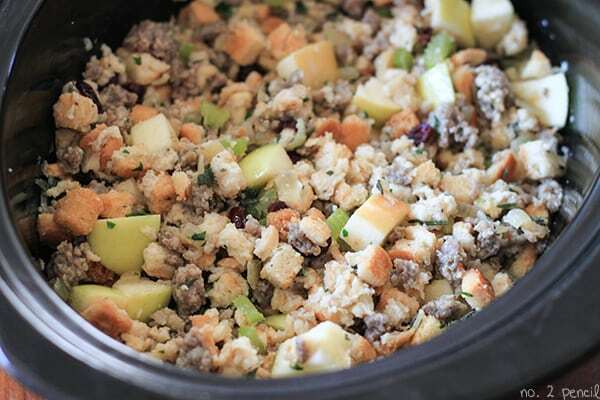 This Slow Cooker Stuffing is going to be your new favorite Thanksgiving side. Not only does it free up a spot in your oven, it is out of this world delicious. It’s packed with sausage, apples, and tart cranberries. Combine that with the fresh sage, rosemary, and flat leaf parsley, and it is Thanksgiving perfection. This slow cooker stuffing stays moist and flavorful, while the sides get crunchy and delicious from the heat of the slow cooker walls. For more Thanksgiving sides, check out my Make-Ahead Mashed Potatoes and my Corn Casserole. Start by sautéing onions and celery is a large sauté pan. Brown one pound of sausage. I usually use a 1 pound chub of breakfast sausage. 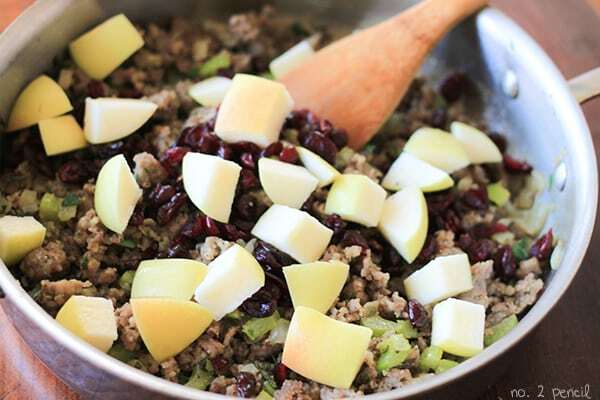 Stir in fresh herbs, dried cranberries, and diced apples, and get ready for your kitchen to smell like Thanksgiving. Once those fresh herbs hit the warm pan, it is heavenly! 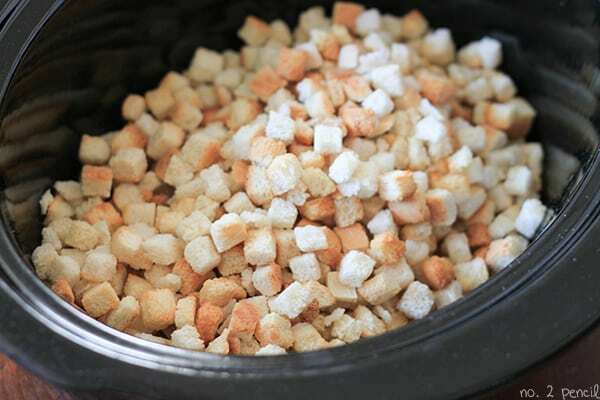 Now grab the big bag of unseasoned bread cubes and add them to the slow cooker. I’ve tried making my own bread cubes, but in this recipe, store bought is the way to go. They save you time and they have a better texture than fresh. Pour the sausage mixture over the top and stir together. Finally, stir in heated turkey or chicken stock and melted butter. Cook for about 4 hours on low. Sprinkle with additional parsley before serving. Saute onions and celery in olive oil over medium heat, until they start to soften. In a large slow cooker, combine breadcrumbs and sausage mixture. Stir in turkey stock and melted butter. Sprinkle with additional fresh parsley. 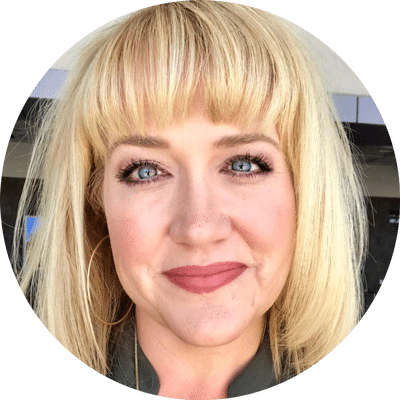 Some of the content in this article was sponsored in partnership with Ebay. This looks so yummy, I will have to make this for thanksgiving for sure! Looks like the recipe calls for “breadcrumbs”, but I’m wondering if this should have been “bread cubes” instead? Yes, thank you for noticing! I’m going to update the recipe. Thank you!!! Awesome. I was 99% sure, but then there was that little part of me that thought that might be a nuance of this particular recipe. I have it on my list for one of my Thanksgiving contributions. Thanks! Where would you buy bread cubes? In the section of the grocery store with bread crumbs? I’m new at this (Hosting Thanksgiving) and I’ve never heard of bread cubes before. Thanks so much for your help! Now that Thanksgiving is getting closer, you should be able to find them pretty easily! My grocery store often has a display with all Thanksgiving related food. Look for a big bag that looks like croutons. About how many does this recipe serve? I have 14 coming and I’m wondering if I should double it. This looks great! Definitely going to try this one. Just curious, what size slow cooker did you use? The recipe said “large” but I’m wondering just how large it needs to be. 🙂 Thanks! Can I use the bagged Pepperidge Farm unseasoned stuffing mix? I haven’t tested it with a mix. So your results may vary. Let me know if you try it. Happy Thanksgiving! I am about to make this and wanted to double check, can I make this today and then reheat it tomorrow for Thanksgiving dinner? I am taking it to someone’s house so will need to reheat it either way. I’m making mine right now, actually! I’m cooking the onions, celery and sausage and mixing everything together except the apples. I’ll add the apples and cook it in my slow cooker tomorrow. You can cook it today and reheat it tomorrow, if that’s easier for you. Sorry, one more question, my husband bought Italian style smoked sausage, can I use this or should I go buy breakfast sausage? Thanks so much. I don’t think smoked sausage will work the same. You need ground breakfast sausage you can break up as it cooks. I’m actually cooking the stuffing as a last minute favor. using that really make an extreme difference? You’ll need to cube them and bake them on a low heat until dry and crispy. Then use less broth. You’ll have to add a little broth at a time to make sure it’s not soggy. Let me know how it goes! I made this today for the very first time and it was extremely well received. everyone loved it, and it was so easy to make. i followed the recipe to a T and it turned out perfectly. i think it might even be better than my grandma’s stuffing. just dont tell her! We used this recipe for thanksgiving and had to use orange flavored dried cranberries as it was all we could find. There was very little left over! I noticed however after 5 hours on low I still had a lot of liquid in the bottom and never got any crispness. Any advise? Loved this Stuffing! I made it this Thanksgiving and it was a great compliment to my turkey, mashed potatoes, brown gravy and caramelized carrots! Yummy! I found some “old fashioned” dried bread that was seasoned and omitted putting any more in. Worked beautifully. So excited to have a yummy stuffing that I love!! Thank you! hi there! I am hoping to make this this year for Thanksgiving. My mother-in-law has some sort of issue where she cannot have dried cranberries. I’m wondering what your thoughts are about replacing those with dried cherries? I think that sounds great! I love that idea! So not a huge fan of sausage. 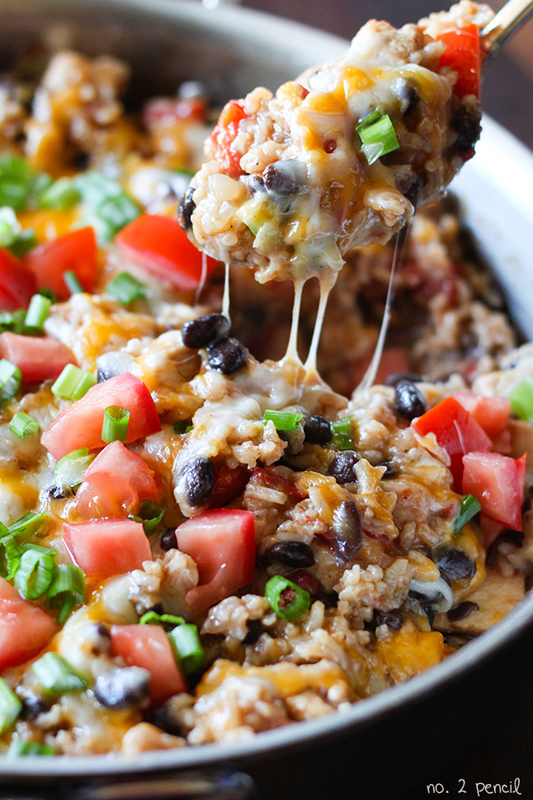 Should I try ground turkey or just leave the meat part out completely? Thanks. Do you like turkey sausage? That would make a great sub. Have you tried other types of apples, maybe Granny Smith? I haven’t, but I think Granny Smith would be just fine! Have you ever tried doubling this recipe? If so, did it come out ok, and what adjustments would need to be made? Thanks! You can double it with no adjustment except cooking time. I haven’t made a double batch in the slow cooker, so I can’t say for sure how long it will take. Adding an hour might do the trick, but I would give yourself extra time just in case. Let me know how it goes! Do you drain the sausage mixture before combining it with the bread crumbs ? I don’t. I use Farmer John breakfast sausage and have never had it release enough fat to have to drain. Hi Jennifer. I am excited to try your reciepe. I cook gluten free and have baked corn bread and am going to cube it and then bake it so that the cubes are crispy. Do you think I should use the same amount of broth? i asked the same thing. i havent recieved a reply yet, but i think im going to add a little corn bread. Wish me luck, if it turns out bad i have a box of stove top dressing for back up. I made this today for my family’s Thanksgiving, and I put carrot into it, and I used Sweet Italian Sausage and vegetable stock, and it was so good! I got rave reviews for it, so thank you for the recipe. This will now be a staple at Thanksgiving dinner! That’s so great to hear! Thank you!!! This recipe beats all other stuffing recipes!! My family absolutely loves it! I’ve made it two years in a row now and everyone raves about it. I decided to double the batch so we could enjoy it as leftovers. Can’t wait to dig in again. Thanks so much for this delicious recipe. Thank you, Jan! So happy to hear they love it! Happy day after Thanksgiving! Made this yesterday for a late Thanksgiving dinner and it was delicious. I am glad it was a large recipe because with just my sister and I there are still lots of leftovers. I will definitely be making again. I used turkey sausage and seasoned stuffing and added chervil. Thank you so much! Love hearing that! This was fantastic! My husband and I couldn’t get enough, and I made it again right after Thanksgiving so we could gorge ourselves on it. It will be at our Christmas table, too. Thanks so much! I always add some toasted pine nuts to mine. Do you think you could stuff a turkey with this recipe? I made it last year and it was delicious! Can you make this the day before Thanksgiving? can you add cornbread to the mixture? has anyone tried doing this recipe in the oven instead? If we were to add pine nuts, when do you suggest to add them? I haven’t tried adding them, but I think I would toast them before and add them in with the rest of the ingredients. How do you think this recipe would turn out without the sausage? 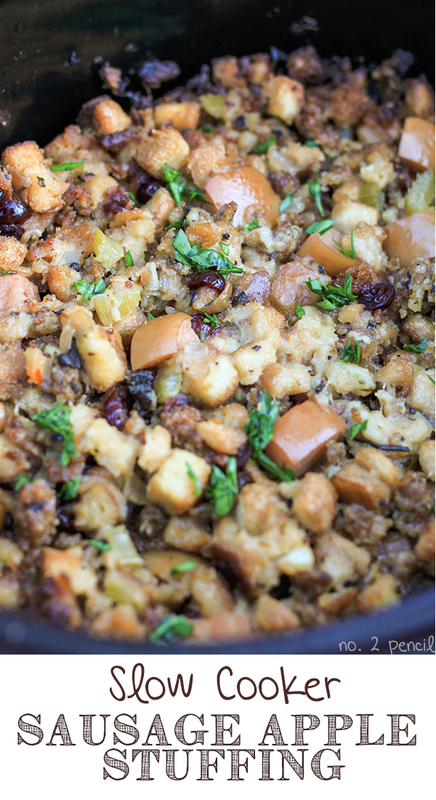 I love the apple, cranberry part, but my family isn’t a fan of meat in their stuffing. Would any adjustments need to me made? Also, would a double batch fit in a single crock pot? I also noticed some people said they used stuffing mixes. I am guessing that if you used a stuffing mix you would omit the herbs and seasoning listed in the recipe? I love this recipe! Not only because it tastes amazing, but because since my husband retired he has been doing most of the cooking ( he’s amazing!) and he has been trying out different ways to cook a turkey. He has BBQ’d one on the rotisserie and gas grill, today is spatchcocking it and cooking over charcoal on his Komodo Joe (egg), and next wants to try deep frying one. I always used to STUFF the turkey, but can’t with these methods. So I LOVE that I can do it in the crockpot (and I don’t have to try jamming it all into a turkey-which I never have enough room) and I feel this recipe is as good or better tasting, which I didn’t expect! I didn’t change anything except I use sourdough bread, because I love it. Thank you! My parents always did a sausage and apple stuffing when I was growing up. When it was my turn to bring a side somewhere for Thanksgiving, I looked for an actual recipe and found yours. I have been making this now for years and it is always a hit. I do use fresh cranberries (less is more) instead of dried and it usually gets made the day before and then baked in oven on Thanksgiving but I follow everything else. 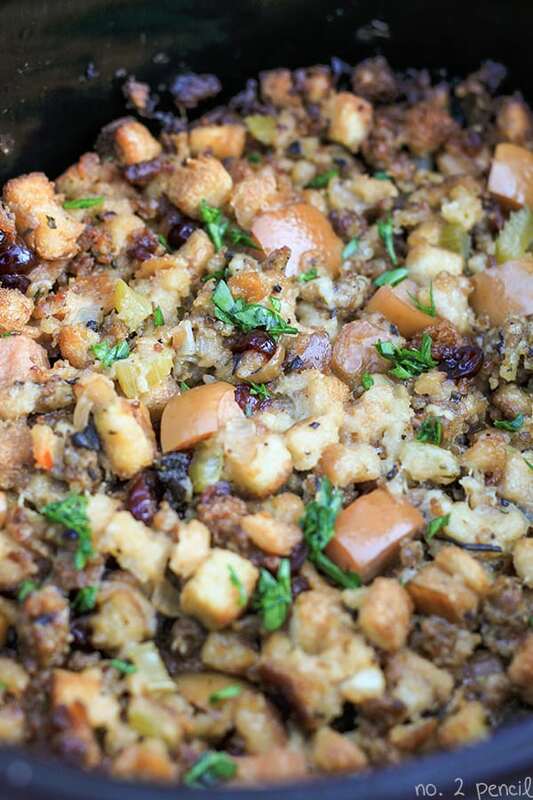 Thanks for a new twist on the sausage and apple stuffing. It’s perfect.